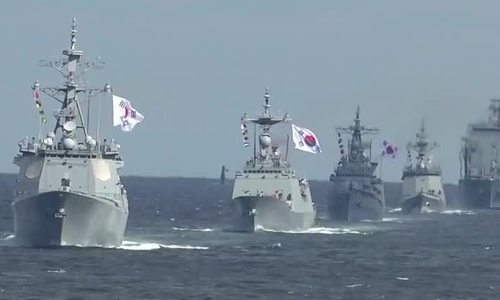 South Korea hosts an international fleet review off the coast of Jeju with 19 naval ships from 12 other countries, including Vietnam and the U.S.
South Korean President Moon Jae-in attended the event Thursday with delegations from 46 countries, the presidential office said. South Korea also hosted an international fleet review in 1998 and 2008 "to inspect combat readiness of warships and discipline of sailors," according to the navy. Japan decided not to take part after Seoul effectively asked Tokyo not to fly its "Rising Sun" flag on a warship. Many people in South Korea see the red-and-white flag as a symbol of Japan's past military aggression. Vietnam's 015 Tran Hung Dao, a Russian built Gepard-class frigate with advanced military equipment, arrived in South Korea Wednesday for the fleet review. Vietnam's Tran Hung Dao is on its to Japan, South Korea and China, beginning last month. The voyage, the longest that any Vietnamese naval vessel has undertaken, aims to strengthen friendly relations, cooperation and development among naval forces in the visited countries and affirm the capability and position of the Vietnam People's Navy in the nation’s international integration.